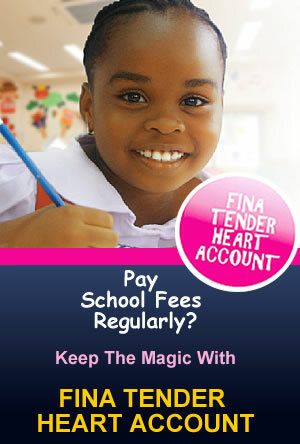 Fina Tender Heart Account is an account for children. It has special features designed to benefit parents seeking to save for the education and other needs of their children. In addition, promotes savings culture in young children and teenagers thus educating them on the importance of saving and investing for their future. Attractive and competitive savings interest rate. Child will be issued a debit card upon parent’s request. Opportunity to save regularly with standing instruction. Opportunity to qualify for children’s shopping spree and other children’s day event. Provides a convenient means to save regularly through standing order. Passport photograph of parent and child (2 each). Birth Certificate of child (optional). Valid identification of Parents: Drivers License/International Passport/National ID Card/Voter’s card.